After building my 20:1 TARDIS, I wanted to build another spaceship, but this time, I wanted to build a real one. I wanted it to be a well-known rocket, but more importantly, I wanted it to be a huge rocket. The Saturn V Rocket was designed in the early '60s by Werner von Braun and Arthur Rudolph, two NASA scientists. To date, it is the only manned spacecraft to ascend higher than a low-Earth orbit, and is the tallest, heaviest, and most powerful vehicle ever made. It weighed 6.7 million lbs, and its 5 Rocketdyne F-1 engines propelled it with 7.6 million lbs of force. It was used in the Apollo missions (including Apollo 11, the first manned mission to the moon), as well as the launching of Skylab, a space station used by NASA until 1979. The Saturn V was built during the Cold War, and the Soviet Union came up with their own rocket similar to the Saturn V, the N-1. However, in the four launches of the N-1, it never flew without exploding for more than two minutes. One of the N-1's catastrophic failures ended in the largest man-made non-nuclear explosion of all time! The Saturn V, on the other hand, completed 13 successful launches. I hope you like my build! 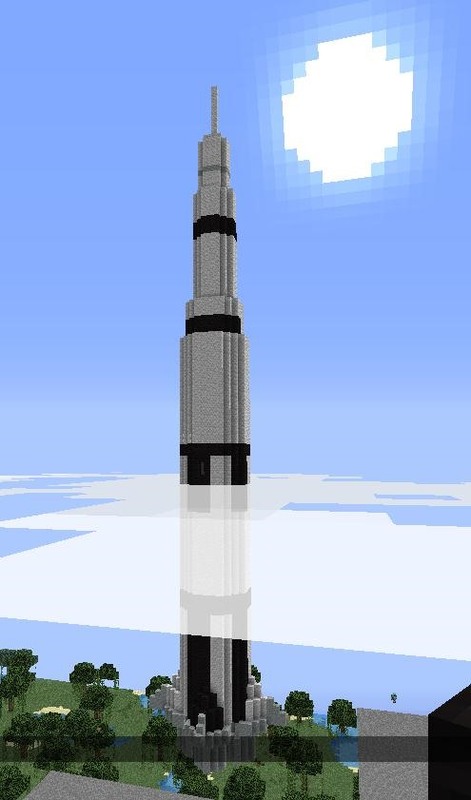 It's 113 blocks tall (the Saturn V measured 111 metres; I had to include two more levels to make the slopes nicer looking), which is the tallest thing I've ever made. Coordinates: (-1800, 100, -200). Wow, what a great replica, Portal! I've been to visit parts of the real thing at NASA, and it's pretty awe-inspiring!